For over 2000 years, vinegar has been used for a variety of culinary and traditional purposes. 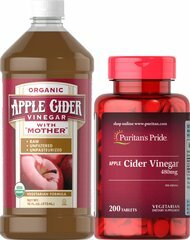 This apple cider vinegar is unpasteurized and unfiltered, so it contains the naturally formed constituents referred to as the "mother." Only certified organic apples are used in our Organic Apple Cider Vinegar so you can feel good about using it.